Sonia Marcella Martinez’s profile picture on Uber shows a grinning woman wearing big sunglasses and a headscarf. Martinez has been working as a part-time Uber driver in Denver, and has been loving the job (and the extra income it brings in addition to her full-time job as a pharmacy technician). That is, until a racist online troll tried to get her fired for being a Muslim. It all started with a Facebook group which Martinez joined to connect with other women drivers. The group of around 500 members compares tips and tricks on the business; it was there that Martinez encountered Rene Hunter. Hunter, a registered Uber driver-partner (and occasional passenger) herself, reportedly asked Martinez if she’s allowed to drive in the U.S. Hunter, who is from North Carolina, also asked Martinez if she wears a headscarf while driving. When Martinez responded that she does, Hunter immediately blocked her on Facebook. 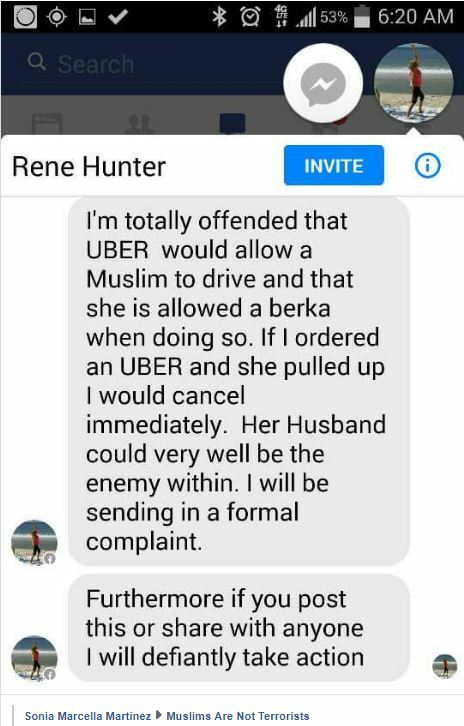 I’m totally offended that UBER would allow a Muslim to drive and that she is allowed to wear a berka when doing so. If I ordered a UBER and she pulled up I would cancel immediately. Her Husband could very well be the enemy within. I will be sending in a formal complaint. Furthermore if you post this or share with anyone I will defiantly take action. And that’s when the tides turned, igniting a firestorm of internet outrage against Hunter. Within the next few days, the post went viral on social media sparking anger among Muslims and non-Muslims alike. Not only that but commenters also took real-time action. They shared Hunter’s contact information and the personal Facebook messages they sent her. One woman even sent complaints to Hunter’s employer, a real estate company in North Carolina — a move that some thought went a little too far. “I asked them to immediately institute cultural sensitivity training for the entire organization. I have no wishes to get Rene fired, but wish to see her and everyone else in the company properly trained,” said Tracy Doudon in an email. Services such as Uber have given women a way to break into the traditionally male-dominated driving industry. A Uber spokesperson said that in 2014, the company estimated that 14% of its drivers were female. That’s not a huge number, but it’s massive compared to the number of women who are currently driving yellow cabs in NYC (around 2% of taxi drivers). But a 2017 study that examined over a million Uber drivers found that women earn $1.24 per hour less than men driving for Uber. Martinez, for her part, says that while she was dismayed by the racist message, her experience with Uber has been great overall. “I joined that group to connect with other woman drivers, so we can discuss issues and strategies, so I can become a better driver. 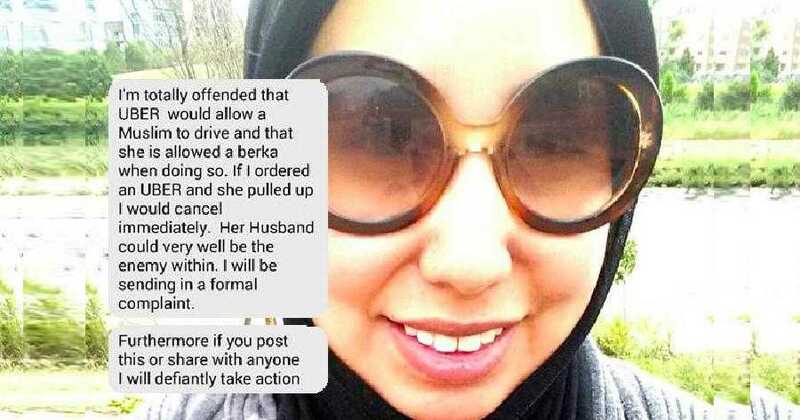 I was not at all prepared to encounter a woman who would have a problem with me being Muslim and wearing a headscarf while I drive,” Martinez said.